China produced 680,000 electric vehicles last year, as much as the rest of the world combined. But by 2020 the Chinese hope to make and sell 2 million EV’s a year, and to go on up from there. The Chinese Communist Party is determined to reduce air pollution and cut China’s vast carbon footprint, for reasons of domestic harmony and international standing. And if the CCP wants to do it, it probably can. 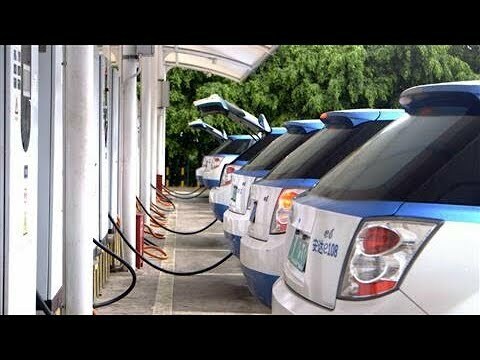 Chinese EVs have the potential to dominate the world market. That sort of development could accelerate China’s rise to the biggest world economy and the dominant superpower over the next two decades. Making EVs on this scale has an impact on the rest of the world. Not only will other countries import electric cars from China, but the more it makes and sells the cheaper and better they will become. We are looking at everyone’s future here, not just China’s. 1. Electric cars don’t have pick-up for merging on the highway. That is ridiculous. The Chevy Bolt, the Tesla 3, the Nissan Leaf all have plenty of pick-up and in fact the Teslas are almost like race cars. They handle nicely. 2. Electric cars have limited range and might leave you on the side of the road. Well, look, they do have a range. But the current generation get something on the order of 250 miles on a charge and 95% of the trips you make are more like 5 miles unless you are a long distance commuter. If you need to go farther than 250 miles, rent a car or take a bus. It likely isn’t that often. I used mine to commute into work in Ann Arbor when the ranges weren’t nearly as good, and never had any problems getting around town. Besides, the Tesla 3 in particular charges quickly and there are an increasing number of charging stations. 3. Driving an electric car just shifts carbon dioxide emissions from the exhaust pipe to the smokestack. This allegation is just untrue. All electric cars on the road today are less polluting than all gasoline and diesel cars, even in dirty grid states like Pennsylvania and Michigan. But there is more. The US in the past decade has gone from getting 8% of its electricity from renewables to 18%. As more wind and solar projects come on line, that percentage will rapidly increase (Iowa electricity is already 33% wind). Over the time you own the car, your electricity source will get cleaner. All the coal plants will soon be closed. And there is yet more. If you are a homeowner, you can put solar panels on your roof and fuel the car from them. The combined EV-panels will get paid off more quickly by saving on electricity and gas bills, and you’ll be driving on sunshine. 4. EVs are expensive. Sure they are for a lot of people, but they now range in the US market from $23,000 on up. Middle class families buy cars in that range all the time. You may be eligible for a tax break of several thousand dollars from your state or the Federal government, in addition. And, remember that the fuel is virtually free. The average American spends on the order of $2,000 a year on gasoline or other automotive fuel, which over a decade would be $20,000. In other words your $25,000 gasoline car is actually $45,000 over ten years. But especially if you have solar panels, your EV fuel costs are nothing, and they are negligible even if you don’t. And remember, your gasoline car is causing extreme weather, which could hit your house and family and be very, very expensive. Your EV isn’t endangering your life savings in the same way. It is much, much cheaper. Besides, the cars will rapidly come down in price.